Jim Boeheim and the Orange met Connecticut for the first time since Big East days in 2013, in Thursday’s semifinal matchup at the Battle 4 Atlantis in the Bahamas. 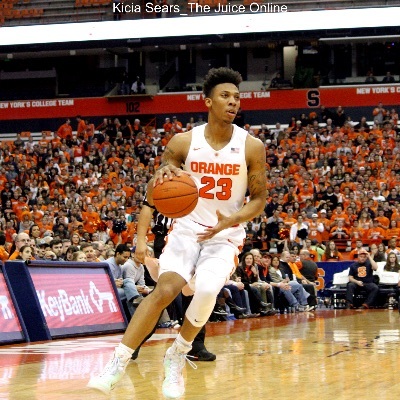 WHAT HAPPENED: Meeting its former longtime Big East rival for the first time since 2013, Syracuse trailed most of the first half before coming back to tie the game 34-34 at intermission. Midway through the second half the Orange went on a 10-0 run to boost the lead to seven, then up to 10 after three consecutive transition baskets midway through the half. 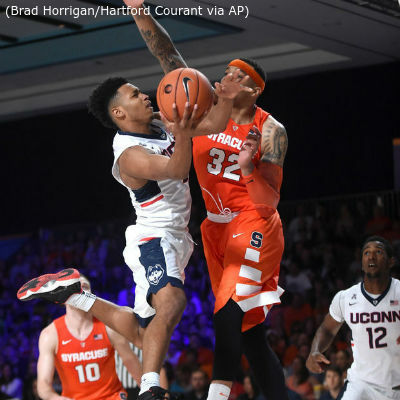 The Huskies (4-1) made one last run on a barrage of three pointers to cut the lead to three in the final minute, until Syracuse (5-0) held on with Tyler Roberson grabbing an offensive rebound (nine rebounds total) the seal the victory. ANALYSIS: Facing its toughest opponent of the first five games in the Huskies, this was a battle of active defenses, UConn’s man and SU’s zone, while the Orange continued to display an impressive transition game with great passing to set up open look, three point shots, layups or dunks. 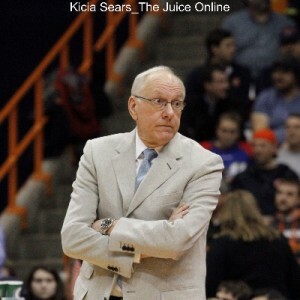 SU’s versatile offense was again on display with five players in double figures led by Trevor Cooney and Michael Gbinije with 17 apiece, and the ‘Cuse out- rebounded the Huskies 46-35. HEROES: Tyler Lydon was one of the five Orange players in double figures, but his baskets were at several big points in a close game, and he had a key block in the final 1:12. In addition to his 16 points, the fabulous frosh had 12 rebounds and filled in underneath on defense for foul-plagued Dajuan Coleman (strong with eight rebounds). Connecticut’s athletic forward Daniel Hamilton had 18 points, 12 rebounds and seven assists. ZERO: Too much sloppy plays at inopportune times, and when the defense sagged too far back late in the game, UConn buried several three pointers to get back in the game in the final 4:00. SU also missed too many free throws down the stretch, finishing just 24 for 39 from the line (62%). WHAT’S NEXT: Syracuse finishes up in the Battle 4 Atlantis event playing for the championship versus No. 25 Texas A&M (6-0) on Friday afternoon. A&M held on edge No. 10 Gonzaga 62-61 in Thursday’s first semi-final, as a last second shot for the Zags was off the mark at the buzzer. Game Time: 3:30 p.m. ET / TV: ESPN.